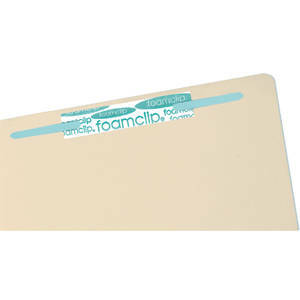 Self-adhesive foamclip® fasteners are perfect choice for organizing any 2-hole punched papers. These fasteners bond permanently to file folders, pressboard, plastic, wood, glass, even metal. With their superior strength, foamclip® fasteners can't be pulled off like other brands! The 2-3/4" center-to-center, 1-1/2" capacity fastener is easy to use; just peel off backing paper and press fastener into place.